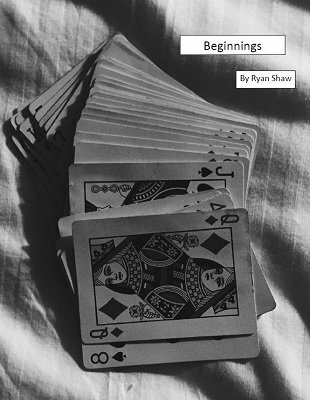 A wonderful collection of original magic/mentalism effects and theory. The Assumption Principle: A deceptive but simple and versatile principle that you'll surely be making your own tricks with. Bluff ACAAN: To the spectator, it is a meaningful take on the ACAAN using a shuffled deck and free choice. They can handle the deck for the naming of the card and number. They can deal the cards. The Passive Force: An idea for an elaborate forcing method which you may already use, but have never realized it or thought of it in this way. The Build Up Principle: You'll totally transform your perception of performing tricks once you're introduced to this principle and you'll begin to discover how to use the world around you everyday to make your effects more impossible than ever. Change: My thoughts on bending coins and a way for you to do it for cheap. Shuffled: An impromptu miracle. A borrowed deck of cards is shuffled thoroughly. You turn around and they look at a card, then cut the deck. You name the card. One Word, Two People: The magician presents an envelope which is in full view for the entire trick. Some spectators are called up to write down words on index cards. After someone from the audience chooses which cards to eliminate, the last one is revealed and it matches the word inside the magician's envelope!